We were excited when Martin Williams approached us to create a series of images to tell the story for the Integrity line of window products. The history of Marvin Windows dates back to the first quarter of the 20th century as a family owned and operated company located in Warroad, MN. We worked closely with MW creatives at to bring the production to life late last fall. After prepping the various scenes with the correct products, our talent fit seamlessly and often passed for the real workmen on the job site that our location scout had sourced. We managed to avoid all the 2x4's, carpentry tools, and even a fresh concrete pour to carry out our scenes without disturbing the work being performed. This week we are on the road in San Diego, CA creating some inspiring new still + motion work for Schwinn Bicycles. It's always nice to venture south to California, especially this time of year. Couldn't be a better project, agency, and brand to be working on. Launching today the March issue of Photo District News (PDN) features an article by Holly Stuart Hughes about the Fall Issue of the JCP Newspaper. We were excited to get the call for the interview / profile and hope you will take a few minutes to check it out. If you missed out on the Fall Issue you can catch up via the link here: JCP Newsprint. The Winter Issue will be printing soon, hitting mailboxes in mid to late February. We're back in the office and excited for the start of 2012 after some time away. The first project-based post of the year features a production for XtremeMac, a branch of Imation. They came to us last fall with a proposal for a one-day shoot involving stills and motion, eager to promote their latest Mac oriented accessories. We started the conversation with their Senior Industrial Designer who was instrumental in bringing us up to speed on their needs and how we could possibly collaborate on the project. The products from XtremeMac range from iPhone + iPad cases to various charging units and everything in between. Our aim was to showcase these products in natural, real life settings with our talent interacting with the accessories. One way we were able to achieve this, within the parameters of a one day shoot, was to work in tandem with our DP Alex Horner to capture a similar look and feel to the still content. For each scene we were able to have Alex mirror the video footage with that of the stills being shot in order to maintain an overall consistency throughout both mediums. Over the course of the day, we put the XtremeMac line of goods to the test in several unique locations around the Minneapolis area and came away with a broad range of both still and motion based content. Under normal circumstances a shoot of this nature would probably be carried out in two or three days, but one long day was what our budget permitted. Our intrepid crew was instrumental in pulling it off with all production coordinated by Bobbi Peacock. Looking back on this day of shooting it's hard to believe we managed to accomplish what we did, both stills and motion in so many locations. I'm sure our crew was just as astonished with the number of locations, product and wardrobe changes, and overall hustling that occurred throughout the day. Project requests for still and motion content continue to build and it’s looking to be another exciting year in the business. Keep in touch with the blog as we will be posting the final edits from the XtremeMac video in the very near future. On the road with my family - a southern bound three-week road trip with many stops including Savannah, Georgia where we currently reside. Early in our travels we made an unplanned detour to briefly explore and photograph Johnny Cash's childhood home in the northeast tip of Arkansas. 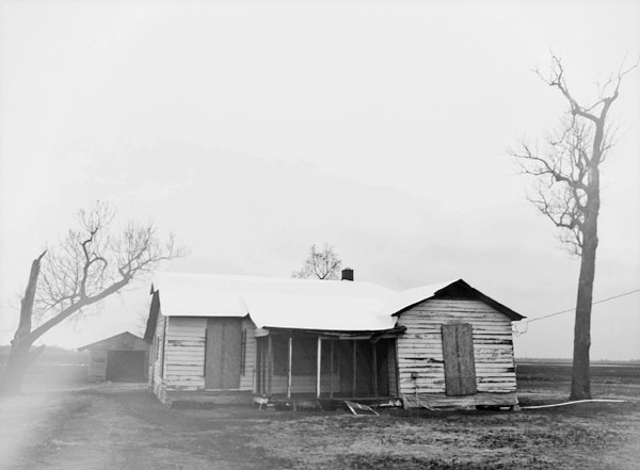 With some perseverance you can find the Cash homestead at 4791 CR-924 just outside the city limits of Dyess in Mississippi County, Arkansas. Johnny moved to Dyess when he was three and lived here until he graduated high school in 1950. The town began as an agricultural colony during the New Deal. The original township had 500 individually owned and operated farms which were either 20 or 40 acres each. The house was recently purchased by the State University and will eventually become a museum. As you can see it will be some time before it opens as it's currently boarded up and all roads leading to it are heavily washed out. The refurbish will improve things, but no doubt something will be lost that time has gifted it through it's many years of disrepair. According to his son John Carter Cash, "The rich gumbo dirt here made his spirit strong. His music came from here, as well as his faith and his family. He learned to work hard early in life."